The seed for the association that lead to the first importation of Lambrettas, to Australia, began back in July 1937 with Samuel Jamieson and Walter James Halls forming “The Conway Importing Corporation Pty. Ltd.”, with capital of £2000, to carry on the business of merchants, traders, importers and commission agents. However, by January 1940 that company was in liquidation. Walter James Halls was at the time the managing director of his father’s company, H. H. Halls and Co., jewellery wholesalers, importers and manufacturers agents. In October 1946, Sam Jamieson, the son of a Newcastle masterbuilder, with his brothers, Arthur, John and David, formed Guinea Air Traders, an air transport service which began operations out of Lae, New Guinea carrying general goods and passengers across New Guinea. Air companies in New Guinea at the time were controlled by Australian government regulations and it wasn’t long after the formation of the Guinea Air Traders(GAT) that John Jamieson, then manager of GAT at Lae, left for Sydney to establish the GAT headquarters at 10-12 O’Connell Street – the future address for Lambretta operations. Sam Jamieson must have had some connection with the motorcycle trade in Sydney at the time as he leased a Lockheed Hudson ex-bomber from Lionel Van Praag, a famous Sydney speedway rider and the 1936 World Speedway Champion. The Jamieson’s GAT operation in New Guinea expanded over the next two years and in 1947 they purchased two Douglas C47s and both Sam and John were among the first to recognise the potential goldmine of migrant runs into Australia. They immediately put one of the C47s on the Rome to Sydney run, flying over empty and bringing migrants back to Australia at about ‘300 quid’ each. This run was so lucrative they also pressed the other C47 into service on the Rome to Sydney run at the expense of the New Guinea operation. The flights were piloted by Sam and Lionel Van Praag as well as other pilots. There can be no doubt that Sam Jamieson used his time in Rome to scout out potential importation deals into Australia and would have seen the explosion of Vespas and Lambrettas on the streets of Rome. In October 1948 Sam Jamieson sold out his interest in GAT as his business life was in Europe and he left the operations up to his brother John, who tried to run operations from the 12 O’Connell Street address. It is recorded, in the official Piaggio advertising, that the first Vespa was sold in Australia in 1951. However, it appears Sam Jamieson may have been the first person to import Vespas into Australia in 1948 as a photo exists of him sitting on the first Vespa in Australia in front of his C47 and the first ad for Vespa and Ape in Australia appeared on 26 March 1949 being sold through the Lancia dealer, Robert Dewley Pty Ltd, at 80-84 Parramatta Road, Stanmore – an address used later by Jamieson’s Lambretta importation company. These Vespas preceded the flow of Douglas Vespas as Enrico Piaggio held off selling in the Commonwealth markets that Douglas were to supply. Sam Jamieson, perhaps not being able to establish a ready supply of Vespas because of Enrico’s commitment to Douglas, turned to Lambretta. What is certain is that in about April 1949 Sam Jamieson, in conjunction with his old friend, Walter James Halls, set about importing the first batch of model B and 3 wheeler Lambrettas and by mid-May 1949 these Lambrettas were on board the S.S. Ridderkerk, loaded at Rotterdam, bound for Australia. It was on 15 June 1949 that the SS Ridderkerk arrived at the Sydney docks with the first shipment of Lambretta Model B's and 3 wheelers. 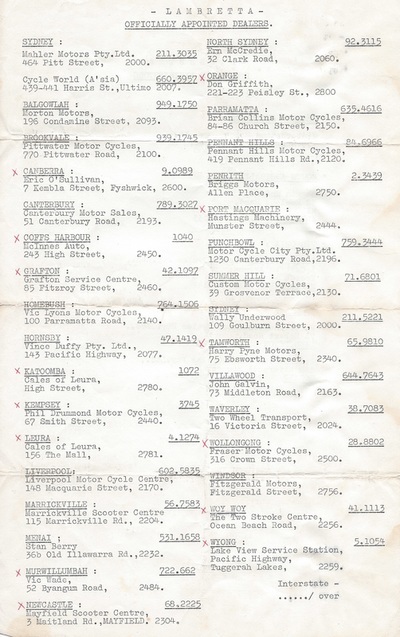 Press reports state that H. H. Halls were the importers and they were at 50-54 York Street, Sydney - an address that Sam Jamieson used in May 1949 in his dealings with the Government over the importation of these Lambrettas. It appears that Sam Jamieson, in his position as the official Australian Representative of Innocenti SG, appointed general merchant of household goods and hardware firm, Nock and Kirby, as the sole distributor of Lambrettas in NSW, where they sold Lambrettas from the second floor of their 417 George Street, Sydney, address from August 1949 (Source: The Sun 9th August 1949). Other dealers were setting up in other States of Australia all under the direction of Sam Jamieson, most notably Nelson Motor Company in Victoria, Winterbottoms in Western Australia and Maughan Thiem Motor Co Ltd. in South Australia. It is from around this time that we have the first extensive review of a Lambretta model B, from Australian Motor Sport, in December 1949 (See Articles section). The Western Australia firm of Wentworth Motors were advertising immediate delivery in November 1949, but the machine had an article in September 1949 in the Sunday Times. They were undoubtedly influenced by Albert Van Steeg, who migrated to Sydney from the Netherlands in January 1949, before shifting to Western Australia to become a salesman at Wentworth Motors in October 1949. He had a passion for Lambrettas and by 1959 was the manager of the Lambretta division of Winterbottom(Wentworth) Motors Co. selling 60 to 80 Lambrettas a month. In February 1950, Nock and Kirby's started selling the Swallow Gadabout as well as the Lambretta. It's not known if this precipitated them loosing the distributorship for NSW for Lambretta, but it seemed to briefly move to York Motors for NSW and by April 1950 Sam Jamieson in association with Sir Laurence Hartnett, whom many consider as the father of the first Holden car, began selling Lambrettas through Hartnett Distributors (NSW) Pty Ltd., a company set up to distribute the still-born Hartnett car. At first Hartnett Motors sold Lambrettas from 222 George Street, Sydney, which was also the address for Grimes Car Park Pty. Ltd. and in April 1951 had moved to 164-168 William Street. 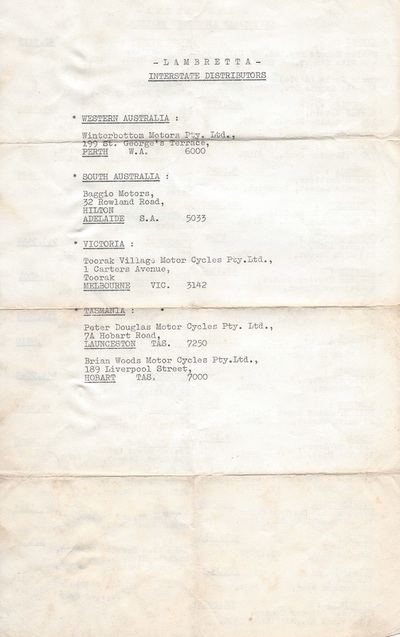 Also by 1950 other States had distributors appointed to sell Lambrettas, with Disney Motors at Corner of Elizabeth and a’Beckett Streets, Melbourne in Victoria and Merchandisers Pty Ltd at 62 Wickham Street, Petrie Bight, Brisbane in Queensland and also an agent in Canberra, ACT, through the local Hartnett agent, K. Grinham of Canberra Rubber Service, off Cunningham Street, Kingston. By May 1951, Jamieson and Halls, the Official Australian Representative for Lambretta scooters and light trucks had established an office at 72 Pitt Street, Sydney and by late October 1951 it appears had taken over operations at the 164-168 Williams Street, Sydney, address, where they now established the company, Australian National Motors Pty. Ltd.
Hartnett Motors at this time was in severe trouble with production issues on its intended car but Australian National Motors still advertised it was a distributor of Hartnett Cars, Sankey Saws, Lambretta, Tempo Trucks and MAN Diesel Trucks. In February 1952, Bryson Industries, the Victorian importer of Jaguar Cars, states in its ½ yearly report that it had recently acquired the Franchise for NSW and Victoria. In April of 1952, a Guide to a Sydney Motor Show shows them displaying with Jaguar cars. Australian National Motors continued selling Lambrettas through till late July 1954, when the company name changed again to Grimes Lambretta Sales and Service, which was a division of Grimes Control Garages and operated out of the same 164-168 Williams Street address using the same phone number. It appears Sam Jamieson was involved in all three companies, Hartnett Distributors(NSW), Australian National Motors and Grimes Control Garages and in fact all three companies had Warren Wallace Alderton, who was a chartered accountant, as a company director and in 1949 he was also a director of GAT using the 12 O’Connell Street address of the GAT headquarters. Sam Jamieson maintained his Importing Office at the Williams Street address from mid October 1951 to at least June 1953. On the 23rd October 1953, Bryson Industries, the franchisee for Lambretta in Victoria and NSW, registered a prototype Australian Built Scooter, and announced it was to go into full production in Victoria. However, in another report from July 1955 it states that it will not make the scooter. By December 1953, the distubtorship for South Australia had moved to J.N. Taylor. In December 1954 Eric Moore Pty. Ltd became the NSW distributor for Lambretta at 80-82 Wentworth Ave, Sydney (Source, Sydney Morning Herald 5th December 1954), setting up Lambretta Sales and Service at 168 William St, and 82 Wentworth Avenue, although Sam Jamieson’s influence on the sale of Lambrettas in Australia was not over and it appears he may have remained as the Australian representative for Lambretta out of premises at 350 George Street, Sydney. Eric Moore’s brother, who operated Hazell and Moore Pty Ltd, began importing NSU Primas in 1956, and are mentioned in the book, Two-up". NSU originally made Lambrettas under license, and were often considered to be superior to the Italian version although much more expensive. NSU eventually went their own way, although they were heavily based on the Lambretta. We have evidence of "Motor Scooters" selling Lambretta in 1956 at 88 Wentworth Ave, Sydney. This company also sold Puch and Vespa. Merna Motors began selling Lambrettas at the 59 William Street, Sydney address that they had occupied for a number of years selling Mercedes trucks and they were a subsidiary of Peter Lloyd Industries Ltd., who were as well, Morris distributors. Recruitment starts quickly with adverts for a saleswoman and a mechanic appearing in the Sydney Morning Herald in February and March 1960. It appears that Merna Motors engaged a number of agent firms to sell Lambrettas in NSW. In September 1960 P & R William advertised Lambrettas for sale as did Capital Motors through October to November 1960. The Rear of Lambretta (NSW) in Yurong St (the Back of William St), Sydney. ​By February 1961 Merna Motors were winding up their association with the sale of Lambrettas and the use of the 59 William Street address, because at the beginning of March 1961 advertisements appeared showing that Lambretta (NSW) Sales and Service were the sole NSW distributor and that they were now operating out of the 59 William Street address. By 1962, this was being advertised as Lambretta Distributors (A/ASIA) Pty Ltd, still at the same address. The new distributor wasted no time in appointing agents across the city and both Ryde Motor Cycles and J Leach Motorcycles became agents for Lambretta as well as Stan Berry - The Two Stroke Specialist at Sutherland and Menai. At this time, other State distributors were appointed and in Western Australia it was Lambretta (WA) Sales and Service Co. at Corner of Mill Street and Mount’s Bay Road, Perth and in South Australia it was J. N. Taylor and Co., 27 Gilbert Street, Adelaide. 1965 was a busy year for new models as June saw the introduction of the Cento, with an article in the Sydney Morning Herald, suggesting that it was "a lightweight the girls will love", and October had the release of the GT200, again, with a news article in the Sydney Morning Herald. In September 1966 Sam Jamieson, who was reported to be a close friend of the Innocenti family, took the distributorship from Lambretta (NSW) Sales and Service and gave the NSW rights to Bill Mahler who operated W. (Bill) Mahler, and at one time was known as Relham Motors, which later became Mahler Motors at 27-29 Campbell Street, Sydney. Bill Mahler sold many brands over the years, such as Puch, Douglas and even in the early 1960’s sold Mazda R360 and 600 minicars. In September 1967 Bill Mahler opened another store at 464-466 Pitt Street, Sydney, which eventually became the Service and Spares centre for Lambretta, with Lambretta Sales remaining at the Campbell Street address. ​The Luna line (Vega and Cometa) and GP range, were launched on the 14th August 1969, in Australia, with an event at Warwick Farm Racing circuit. Then many agents were appointed and amongst them, just to name a few, were Brian Collins Motors at 84-86 Church Street, Parramatta, Motor Cycle City Pty. Ltd. at 1230 Canterbury Road, Punchbowl, Morton for Motor Cycles at 196 Condamine Street, Balgowlah and Vic Lyon Motor Cycles at 100 Parramatta Road, Homebush - so a lot of untrained agents with inexperience in servicing Lambrettas. Lambretta Concessionaires were obviously trying very hard to replicate the success they'd had in the UK and tried to diversify just as they had there. In 1970 they announced that Frank Matich was to become a Director of Lambretta (Australasia) and make his version of the Maclaren sports cars, in Artarmon, that Trojan was making in the UK. Despite a lot of publicity by Lambretta (Australasia) Pty. Ltd. the sale of Lambrettas was falling due to the Japanese invasion of cheap reliable motor scooters and cycles and by February 1971, Lambretta (Australasia) Pty. 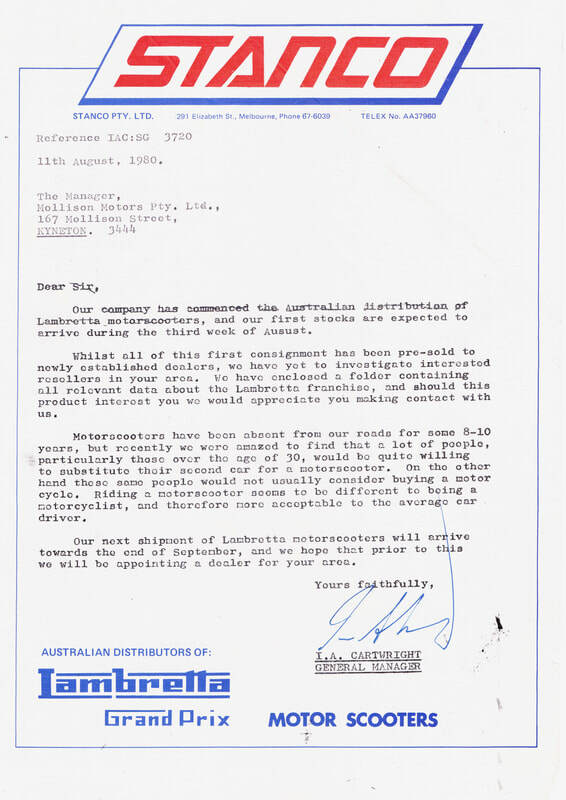 Ltd. closed its doors (Source, Tasmania archives) . By 1971/72 the operation of Lambretta building in Italy itself had ceased, although this is not the end of the importation story in Australia. In the mid 70's Spanish built Lambrettas were being imported and In the late 70's and early 80's, Paul John Scooter Centre of Perth were importing Servetas, which were still badged as Lambrettas for the Australian market. On 11th August 1980, Stanco of Melbourne, started importing SIL GP's and built a dealership network around Australia. All the way to the late 90's various companies continued to try and import and make a success of Lambretta Scooters. However, with the closure of the Indian 2-wheel production line in 1998, under the control of SIL, this all finally came to a close. In 2017, "Lambretta" scooters were imported, once more, into Australia. However, as there is no continuity between any of the original factories and the company currently using the name the LCoA does not recognise the modern scooters as a Lambretta, They are, quite simply, a badge engineered rebodied Kymco.